We made this loaf of bread on our pizza stone. Peel and dice the onions and place in a sauce pan or a covered microwaveable baking dish. Cook until the onions begin to become translucent. If cooking in a sauce pan on the stove top, use a little water to keep the onions from sticking to the pan. Remove from the heat and allow to cool. Cut the sun-dried tomatoes into pieces and set aside. Open the can of ripe olives and pour off the liquid. If the olives are whole, slice them into rings, and set aside. 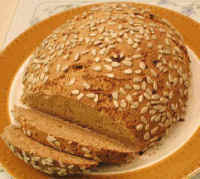 Place the whole wheat flour, rye flour, and caraway seeds in your bread mixing bowl. We use either our bread maker or a mixer for kneading the dough. 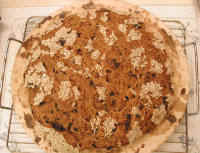 Form a bowl-shaped depression in the flour and add the molasses, lecithin, ginger, and vitamin C. If the flour is warn from grinding your own flour in your Vita-Mix or flour mill, use tap water, if using purchased flour, warm 2 cups of water to about 120 degrees F.
Pour in 1 cup of water and begin mixing the dough. As the dough begins to clump and the water is absorbed, add the yeast and a little additional water to aid the mixing process. Add the onions and sun-dried tomatoes and continue kneading. Add a little water as necessary for proper kneading, but keep the dough slightly on the dry side until the olives are added. After about 15 minutes of kneading, add about half of the sliced ripe olives and continue kneading, for another five minutes. If using a bread maker, remove the dough from the mixer and work additional olives in by hand, being careful to keep the olives in rings. If using a regular mixer with dough hooks, the remaining olives can we worked into the dough on slow kneading speed. 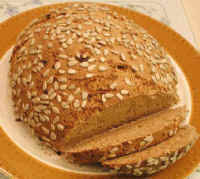 Form the dough into a loaf and cover the entire outside with sesame seeds. 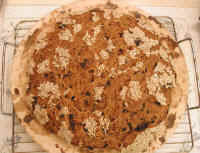 Place the loaf on a metal or terra-cotta baking pan, or pizza stone (which we prefer), which has been coated with a dusting of corn meal or flour. Let rise until loaf is slightly over doubled in size. We have a warming drawer in which to raise the dough, but any warm moist place will work. When the loaf has risen, carefully place in a pre-heated oven at 350º F. and bake for approximately 45 minutes. We have found that baking times vary from oven to oven and it is best to adjust the baking time to the characteristics of your oven. Remove the baked bread from the oven and set on a wire rack to cook. This bread is great to eat in wedges with a large mixed-green and veggie salad for lunch.